The universal right to health is far from being a reality. Diseases such as HIV/AIDS, malaria, tuberculosis and diarrhoea continue to kill millions of the most vulnerable, younger and older human beings. “Health for all” is an educational installation that should raise awareness on Millennium Development Goal (MDG) 6 (“Combat HIV/AIDS, malaria and other diseases”). Through images and objects, we present some of the deadliest diseases from around the world and the means to prevent and/or cure them. The installation’s main structure provides the visitor with key facts and figures on HIV/AIDS, Malaria, Tuberculosis and diarrhoea. It is located within the exhibition on agricultural tools at the Loures Municipal Museum and seeks to bear witness to the need to support causes and policies that promote significant improvements in health care for all. The main feature of the installation is a set of four wooden cubes. Each cube represents one of the deadliest diseases in the world: malaria, HIV/AIDS, tuberculosis and diarrhoea. Three sides of each cube display relevant facts and figures on the disease. The other side of the cube is "open", revealing a small niche with an image of the disease and a package showing the type of treatment available. For example, in the case of tuberculosis, we chose an image of lungs being attacked by the disease and displayed the specific drugs used to combat this disease. 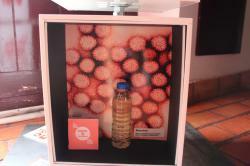 For diarrhoea, we placed an image of contaminated water together with salts used to fight this disease. Visitors can touch all the objects and rotate the boxes to read more information. This installation was set up in a museum room displaying agricultural tools. In this way, we can address the effects of malnutrition associated with these diseases, on the one hand, and, on the other hand, show the impact that food security and food sovereignty will have on the so-called new global diseases like obesity and malnutrition. What do we want to focus on in MDG 6 and why? The major goal of MDG 6 is to stop and reverse the spread of HIV/AIDS by 2015 and to achieve universal access to HIV/AIDS treatment for all who need it by 2020. So, we knew we had to emphasize this theme, showing clearly the causes and consequences of the virus. In addition, with the younger audience in mind, we had to pay special attention to the language and ensure that the message was not discriminatory or dubious. As we did not want the installation to focus solely on HIV/AIDS, we identified other diseases with a profound impact on contemporary societies, particularly diseases with known cures or that are easily preventable. However, the inequality of access to medicines or social inequalities do not allow diseases such as malaria, tuberculosis or diarrhoea to be cured or prevented. After choosing the topic, we needed to think about the space where the installation would be located and how we could link our topic to the museum objects already displayed in that space. It should be emphasised that the dimensions of the space and its ease of access help determine what type of structure can be developed. With the topic and location decided on, it is necessary to think about the materials needed for the installation, to consult suppliers and obtain quotes. It is important to identify a supplier who can meet the design and printing requirements. We should not overlook the environmental impact of our installation and, as such, we should choose, wherever possible, reusable, recycled or certified materials. It is important to set a schedule (deadlines) for delivery of services, setting up the installation and for its inauguration. Identify support materials for the installation, such as the leaflet, which present context, facts and figures in a clear way. All materials should be consistent in terms of graphics, as this installation will be part of a set of ten installations. What to say: The message should be clear, brief, accurate and presented in an appealing way. As we are dealing with a theme that is associated with stigmas and value judgments, it is essential to ensure that the content does not suggest double-meanings. Therefore, we should avoid using humour, which can be misinterpreted. Research: Ensure that data is current and accurate, and is drawn from reliable and credible sources. Writing: Use language that is accessible to all sections of the public and ensure that typography (font, size, colour) is conducive to reading. Leaflet: Ensure that it fits with the topic and that it provides a global and local view of the challenges. Present ways to take concrete action and sites where people can learn more about the subject. The leaflet should have a visual link to the topic under discussion. Signpost: this attracts visitors’ attention to the installation and the theme. Opt for a picture with a brief caption. Throughout this process, ensure that the museum agrees with everything that is written in all the support materials and that the graphic design is consistent between all the materials. Whenever possible, schedule the inauguration of the installation for a symbolic date. The installation is designed to give various levels of information to visitors. It consists of four cubes, each one representing one of the deadliest diseases in the world: malaria; HIV/AIDS; tuberculosis and diarrhoea. Three sides of each cube present relevant facts and figures on the disease. The other side of the cube is "open" revealing a small "niche" with an image of the disease and a package containing the type of treatment available. For example, in the Malaria cube there is an image of the mosquito that spreads the disease and the packaging from an antimalarial drug. In the case of HIV/AIDS prevention, we put some female and male condoms, overlapping on top of an image of the virus. For tuberculosis, we chose an image of lungs being attacked by the disease and the specific drugs used to combat this disease. For diarrhoea, we used an image of contaminated water and the salts used to fight this disease. 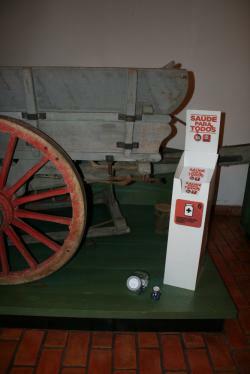 Visitors can touch all the objects and rotate the boxes to collect more information. This installation was arranged in a museum room displaying agricultural tools. In this way, we can address the effects of malnutrition associated with these diseases, on the one hand, and, on the other hand, show the impact that food security and food sovereignty will have on those so-called new global diseases like obesity and malnutrition. Structure: 1.60 m high by 40 cm wide. The preferred channel of communication was the Facebook page "Connected for a Better World ", where we posted formative and informative content on certain diseases and their impacts, as well as on global and local achievements in relation to this issue. Since we are addressing controversial social topics, such as HIV/AIDS and the many stereotypes associated with it, it is essential that the language is clear and positive. The focus should always be on prevention, patient care and action (or lack of it) taken by the competent authorities in response to the diseases in question. We increased publicity on the installation through the use of a Flashmail: a short, very visual email that invites people to visit the installation and learn more about the project. Ideally, a date should be chosen for inaugurating the installation. For maximum impact, we recommend choosing a symbolic date. If possible, you may also wish to consider organizing a small debate on the subject. The installation has been widely publicised through the social networks of partners and partners’ preferred contacts (in this case patient organizations and pharmaceutical companies). The way the installation is designed allows visitors to understand the problem and its solution. Since it has a strong visual component and is interactive, it allows visitors to “know through interacting". It can be used by individuals or by groups. Mobility: the installation, mounted on wheels, is easily movable. 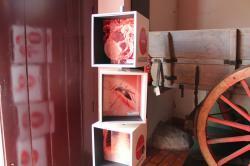 The installation does not allow visitors to compare/contrast the displayed diseases. It is difficult to see which diseases are relatively cheap to treat, as is the case with diarrhoea (which is nevertheless lethal in developing countries). Although it allows group interaction, the installation cannot be handled by more than one person at a time. Elements of the structure can easily be removed by visitors. The weight of the installation makes it more difficult to move. Despite being a creative and effective installation, its location is not the most appropriate. It is a space that is hardly visited by visitors, as it is not in the main building. Visitors gave positive feedback as follows: “the focus on the disease; interesting; appealing; great; creativity; the link between the local and the global; the fact that it warns people of the impact of diseases; it can be adapted to any subject; very practical and functional; very unique communication support; various content options are possible; the display of drugs that cure; the fact that you can play with the installation; the link between reality and prevention; it increases knowledge about the disease and its causes; the link to the surrounding exhibition; the dichotomy between disease and solution; the identification of diseases affecting developing countries”. To the question "what would you do differently", the responses were: "economic benefits associated with health; mentioning generic medicines; address alternative medicines; refer to the pharmaceutical companies and their interests; more dynamic; explore the use of pesticides and oncological diseases; educate people on ways to prevent mosquito bites”.